Welding and metal fabrication employment news. A career in welding may be a great option for a military woman, whether she is still in active service or back in civilian life. Welding often pays well, offers p lenty of room for advancement, and obliterates the glass ceiling that many women face in the workplace. Women have worked in shipyards and factories since WWII, when many men had to leave their welding jobs to serve overseas, opening up an area of work previously closed off to women. Yet, even today, despite the huge advances women have made in all arenas, their numbers are still largely underrepresented in the STEM fields (science, technology, engineering and mathematics). This entry was posted in Welding Education, Welding Jobs on April 1, 2015 by Carmen. So as a reminder, I thought I’d revisit some tips for women welders to succeed in the industry. This entry was posted in New Rosies, Welding Jobs, Working Women & Society on August 28, 2013 by Carmen. What About A Welding Badge for GIRL Scouts? Just received this press release from the American Welding Society celebrating the kick off the 2013 Careers in Welding Trailer tour. MIAMI, Fla., July 22, 2013 – Boy Scouts from across the country are exploring careers in welding as the AWS Careers in Welding Trailer kicks off its 2013 tour at the Boy Scout Jamboree in West Virginia through July 24, 2013. Over 40,000 [BOY] Scouts, volunteers and visitors are getting a chance to try their hand at welding at America’s biggest celebration in Scouting. Held once every three years, this will be the first jamboree at its new permanent home – The Summit, in West Virginia. This entry was posted in Welding Industry News, Welding Jobs, Working Women & Society on July 24, 2013 by Carmen. Is Welding the HOT new career? It seems everywhere I turn these days someone is promoting welding to women. One reason is that the American Welding Society has a new president–a woman named Nancy Cole who was the first woman to graduate with a degree in metallurgical engineering from University of Tennessee. The AWS recently produced this video, showcasing the opportunities for women in the industry. If you know anyone interested in a career in welding, a good place to start is the American Welding Society. On the AWS website you’ll find a welding school locator, information on certifications, and links to the local chapters. If you are a woman interested in the industry, check out these tips for women welders…. 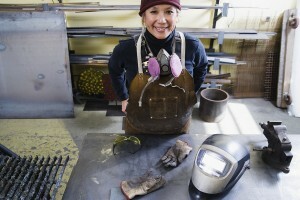 and, if you want to be inspired, read our profiles of women welders, The New Rosies. Finally, if you want to win a CK Flex Loc TIG Welding Torch…. head over to JoeWelder.com and tell us what you’d weld if money were no object! This entry was posted in New Rosies, Welding Jobs, Working Women & Society on July 12, 2013 by Carmen. Then there’s the 4% of “Sheet metal workers”, 1.5% of “Pipelayers, plumbers, pipefitters, and steamfitters”, .6 % of “Structural iron and steel workers”, and18.1% of “Metalworkers and plastic workers and all other”. The good news is that women can take a number of steps to ensure their continued success. 1. Know your job. And by that I don’t mean just the procedures you are required to perform for your current position, but learn TIG welding, MIG welding, learn about welding pipe, become skilled at titanium welding. The more you know about all kinds of welding the more valuable you will be as an employee, and the more employable you will be in the long run. Look into the community colleges or even government-sponsored training programs. For example, San Diego County offers a Regional Occupational Training Program that includes Welding & Metal Fabrication (at little cost). Check for similar programs in your area. Many offer evening classes to accommodate your work schedule. 2. Know the industry. Join the American Welding Society Section nearest you, or at a minimum get on the AWS website and read the news, sign up for the newsletters, and stay informed. 3. Know the tools of your trade. Again, not just the ones you need for your current position but make sure you’re familiar with as many fabrication tools you can get your hands on. Ask those experts to show you how to use them–unless someone is a real jerk, he/she will be flattered to be considered an expert. If hands-on experience is not an option, peruse websites like Arc-Zone.com 😉 who provide tons of great information about their products–check out the Purge Gas section where you’ll see specialized trail shields and purging cups, purge baffles and plugs, and even inflatable purge bladders and all the latest technology in high-purity welding products. You can also learn from Manufacturer’s websites : Miller, Lincoln, ESAB, and Thermadyne to name a few. And don’t forget about trade magazines and professional associations. Arc-Zone has a great list of links to peruse. The bottom line is that to stay employed in this economy you need to be more than just good at your job–you need to be excellent. This entry was posted in Welding Jobs on May 23, 2012 by Carmen.